Quattro Seals™ are four-lobed and feature a geometry with twice the number of sealing surfaces compared to standard O-Rings. With double the sealing surfaces, a Quattro Seal™ can perform at lower pressures and/or with reduced squeeze than a standard O-Ring. The four-lobed design also results in a more stable seal, reducing the likelihood of spiral twisting in reciprocating applications. The reason is that rather than relying totally on squeeze to achieve a seal, Quattro Seals™ employ both deflection and squeeze to create the seal. Use Quattro Seals™ in standard O-Ring grooves or in deeper Quattro Seal™ specific grooves, which results in longer seal life with less friction. 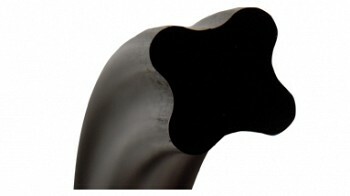 Spiral failure issues are reduced when Quattro Seal™ grooves are narrower than O-Ring grooves. If you seek Quattro Seal™ recommendations, go to Groove Design Chart for Quattro Seals. PSP inventories several different AS568 sized Quattro Seals™ in either 70 durometer nitrile or 75 durometer Viton™.